Dr. Toby Simon is senior medical director at CSL Behring, a biotherapeutics company that is a world leader in fractionation of plasma for blood derivatives. He has previous experience in both blood centers and transfusion services and did research in transfusion medicine for many years at the University of New Mexico School of Medicine and has most recently been a consultant to the NIH REDS II program. He is a past president of AABB and America’s Blood Centers. He served on the American Board of Pathology Transfusion Medicine Test Development and Advisory Committee for over 25 years and is currently in his second term as Inudstry Representative on the FDA Blood Products Advisory Committee. Dr. Jeffery McCullough is professor of laboratory medicine and pathology at the University Of Minnesota School Of Medicine where he has been since 1978 including service as Medical Director of the hospital blood bank.. He directed the entire American Red Cross Blood Program in the past and has also served as President of the American Board of Pathology and several terms as editor of Transfusion. He has directed national research programs and published extensively including a single authored book in Transfusion Medicine published by Wiley. Dr. Edward Snyder is professor of laboratory medicine at Yale University School of Medicine. He also serves as associate chair of his department for clinical affairs and director of apheresis/transfusion service and blood bank. He was an editor of the third and fourth editions of this text. He is a past-president of AABB. He has published extensively and is currently an investigator in the NIH REDS III project. Dr. Bjarte Solheim is Professor Emeritus at the Institute of Immunology at Rikshospitalet University Hospital and University of Oslo School of Medicine in Oslo, Norway. He was an editor of the fourth edition and was instrumental in making this text an international one by recruiting many European authors. While officially retired, he remains active in clinical and research aspects of transfusion medicine. Dr. Ronald Strauss is Professor Emeritus of Pathology and Pediatrics at the University Of Iowa School Of Medicine. Since his retirement from Iowa he has remained active in transfusion medicine research and has also been serving as associate medical director of LifeSource/Institute of Transfusion Medicine in Chicago. He serves on the American Board of Pathology Transfusion Medicine Test Development and Advisory Committee. He has a long research career with several NIH grants and roles in national research studies. He was an editor of the third and fourth editions. 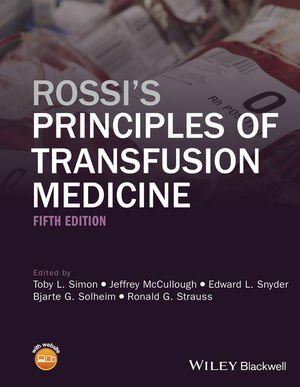 The book has been substantially revised and updated, making it even more a patient-oriented publication with challenging contributions on advanced treatment modalities, including gene therapy, tissue engineering, and regenerative medicine.